JIM STERANKO — TOO SIXTIES FOR THE COMICS? 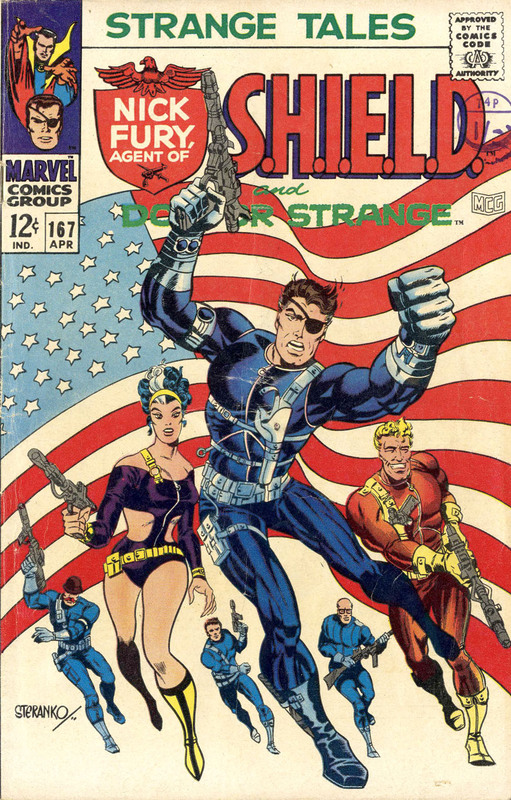 The soi disant bon viveur and stage magician Jim Steranko had an innovative and rightly acclaimed run on Marvel’s Nick Fury, Agent of S.H.I.E.LD. strip in the late 1960s. It peaked with the last few issues of Strange Tales, then a few early issues of Nick Fury’s own comic. After this Steranko drew two X-Men and three Captain Americas, a couple of short stories, and then, as if in a puff of smoke, was gone from the comics field — occasional covers and sideline projects excepted. Nice copies of original Steranko comics fetch premium prices these days. Reprinted editions exist, but are of varied quality, especially if you value the original colouring above the modern versions. 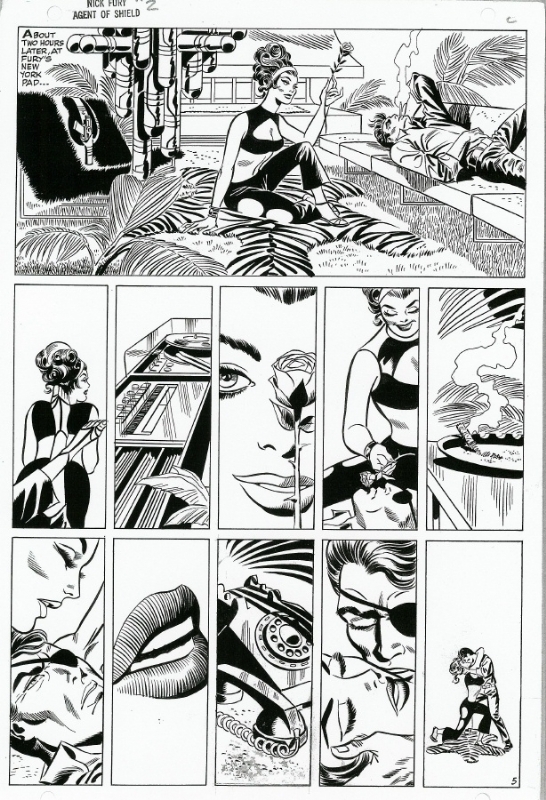 Excitement has been stirred in the hearts of Steranko fans recently by the publication of beautiful, gigantic, hardback, pricey “Artist’s Editions” of his Nick Fury strips, each page lovingly scanned from the original artwork — black and white, of course. But I bring you news of something genuinely rare these days; a real Steranko collector’s item that is well within the means of most collectors. An actual comic-book, by golly. Steranko was definitely hip to all sorts of cultural novelties in the sixties and wanted to reflect these in his Nick Fury pages — in both style and subject matter. Plotting / writing and drawing what was basically a “superhero James Bond” strip, Steranko inevitably pushed the comic-book limits not only of derring-do, spy gadgetry, and frankly psychedelic sixties-ness, but also of sexual imagery. Any Bondesque fiction, after all, demanded some Bondish “Babes” — and a bit of love action. He says “The [censored] panels were covered up with stats.” It looks as if they have been carefully restored to their original sinful form. Warning: snogging, cleavage and an off-the-hook phone ahead! Only view if legal in your local jurisdiction! Less well known is the page shown below, which was also subject to censorship. Again the Contessa Valentina was at the bottom of it. This page is also mentioned at the Legends Revealed blog (at the above link) but until last weekend I had forgotten all about it. It’s from the last 60s issue of Strange Tales, no. 168, cover-dated May 1968, after which Dr Strange and Nick Fury got their own comics. Inks by Joe Sinnott. 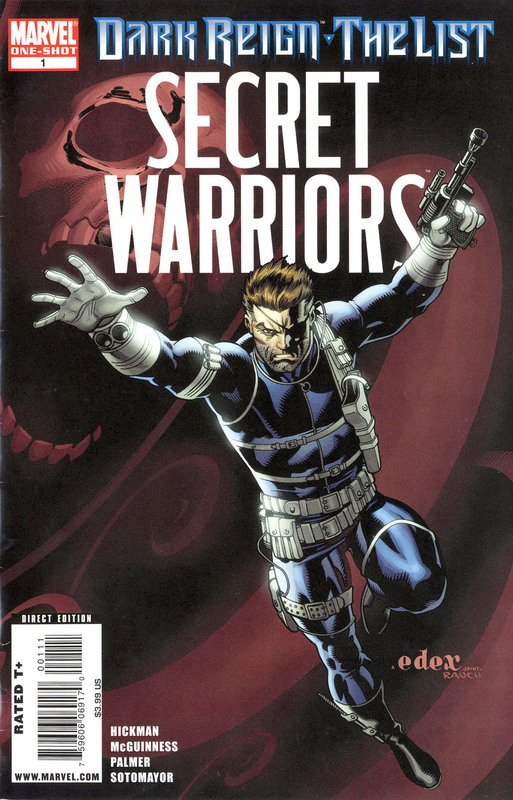 What I can now happily add to the account on Legends Revealed is that Marvel published a pretty handsome reprint of this story in Dark Reign: The List – Secret Warriors One-Shot no.1, Dec 2009. And there, somewhat to my surprise, you can see the Contessa’s uncensored rear view pretty much as it left Steranko’s drawing board. This comic is still easy to find at a cheap price, making it a genuine new (-ish) collector’s item for Steranko fans. It may have slipped beneath the radar of many of them. The colours are a reasonable reflection of the way the book was initially done. (No fancy digital effects which look great on artwork done with them in mind, but can jar so badly with the line artwork of the old comics.) Suffering slightly from bright white paper and garishness, but less than some. I am massively indebted to Andy Williams who drew my attention to this little gem at the London Comic Mart last weekend. Andy may not have known quite what an important bottom he had his hands on, but at least he showed it ’round. For that generous act the world owes him its thanks. I note also that Steve Ringgenberg wrote about Val’s posterior in The Betty Pages magazine no.4, 1989 — http://www.thedrawingsofsteranko.com/bettypages.html and showed a B&W image of the uncensored Val (also borrowed by Legends Revealed). 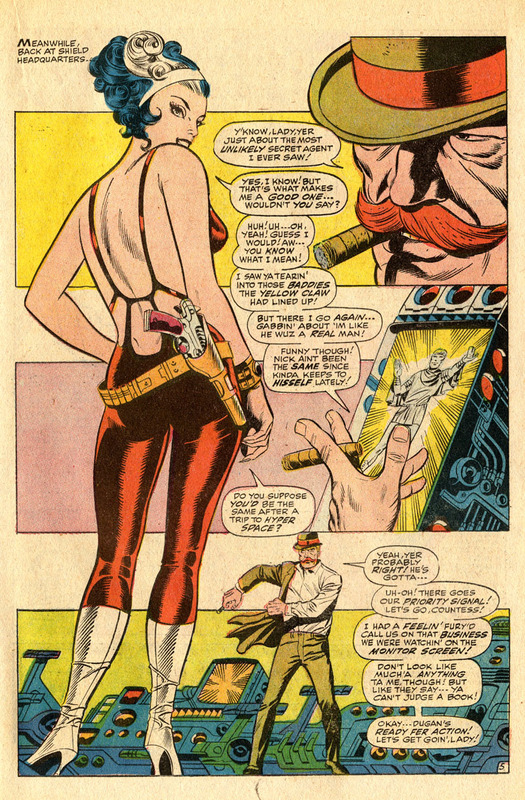 Ringgenberg’s article also details Steranko’s interest in vintage pin-up art. It looks as if Tony Lewis used the Ringgenberg image to recreate a colour version of the Strange Tales 168 page as it should have looked — http://thewastebasket.blogspot.co.uk/2011/09/steranko-uncensored.html . Kudos to Tony, but the Secret Warriors reprint is a superior image taken, I suspect, from the original art or a good stat. How did the original version of Val’s rear survive intact? Was a good quality stat taken before the original art was blacked in, or was the blacking in done on a stat of the page? Perhaps a small piece of white board was glued onto the original art, the new black bottom drawn thereon, allowing for removal later. 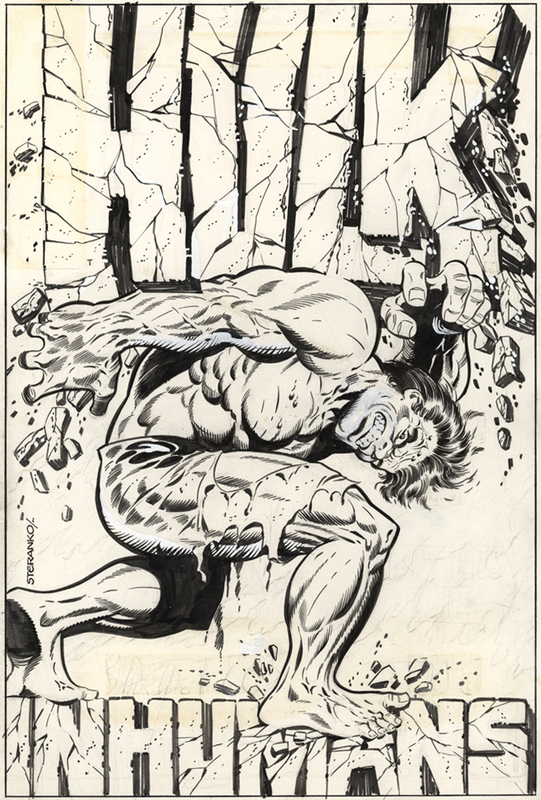 The original art of Steranko’s cover for Hulk Special no.1, 1968, has similarly survived, the published version having had the face redrawn by Marie Severin (and, I think, Frank Giacoia). But why was the Strange Tales 168 strip simply dropped in at the back of the Secret Warriors One-Shot with no fanfare — indeed, with no comment at all? It isn’t mentioned on the cover or even on the contents page. It’s just there, after the main story finishes. Was this reprint chosen very specifically? Did One-Shot editor, Tom Brevoort, know what a major step he was taking in showing this uncensored artwork? The Comics Code Authority was long gone, and far more overtly fetishistic female anatomy had graced the pages of Marvel comics prior to 2009. Mr Brevoort was not pushing any boundaries here. But he may have realised he was filling a gap in many people’s Steranko collections. It is conceivable that it was just a happy accident. Alternative versions of Marvel art have popped up from the files over the years at random — occasionally, if not exactly often. If he knew he was doing it, and was in any way embarrassed about reprinting Val’s shiny bottom, he could have claimed he was reprinting the story because it won fandom’s Alley Award in 1969 for Best Feature Story published in 1968. Perhaps it has been reprinted elsewhere, and this actually was / is no big deal? I know of at least one (digitally recoloured) book reprint of the censored page (see below; it’s from 2001, Andy Williams tells me). If anyone knows about another uncensored reprint, do please let me know. I’d also like to know which version is in the recent Artist’s Edition. Perhaps drawing attention to Countess Valentina’s bottom was, in 2009, still considered in some way in poor taste? It is a potentially sensitive subject. It obviously wouldn’t do to over-emphasise the censored (or uncensored) portion of the image too much. On the other hand, it would surely be remiss not to show a clear comparison of the 1968 and 2009 versions. And just for the heck of it, here’s another fondly remembered Jim Steranko page — printed as drawn, as far as I know — from Captain America no. 111 (March 1969). Inked by Sinnott again. He got all the crap jobs. 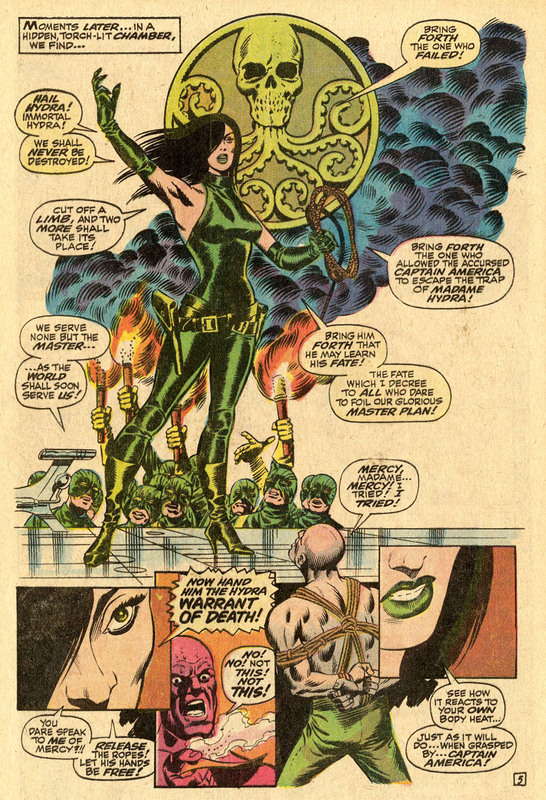 Yes, these uplifting images of Madame Hydra killing a henchman were untroubled by the censor’s inkpot. The Comics Code Authority and / or Stan Lee presumably felt that her large shiny, tightly-clad breasts and her whip were acceptable reading matter for young people, unlike the Contessa’s shiny and tightly-clad buttocks. Chacun a son gout, as they say in Gay Paree. 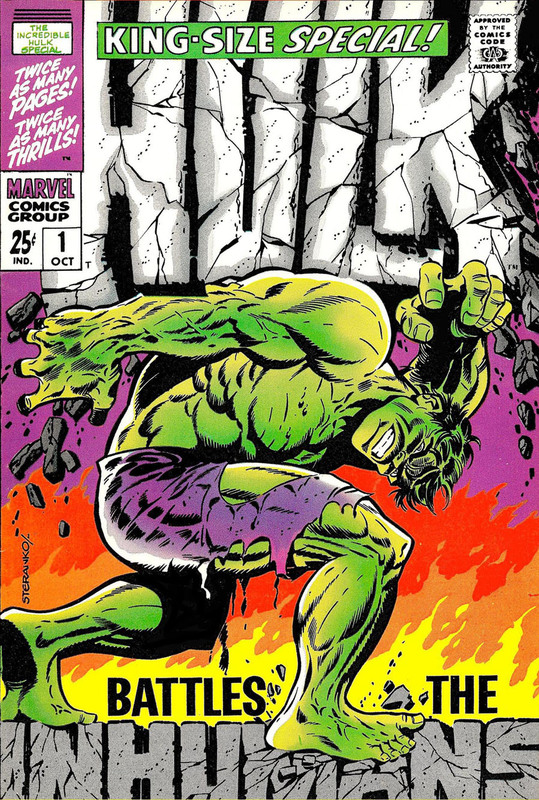 This entry was posted in Comic-book art, Comics, Jim Steranko, Superhero movies and tagged Alley Award, Andy Williams, Artist’s Editions, Black Widow, Captain America, Comic Book Legends Revealed, Contessa Valentina, Doctor Strange, Dr Strange, Iron Man, James Bond, Jim Steranko, Joe Sinnott, Madame Hydra, Nick Fury, Richard Martines, Steve Ringgenberg, Strange Tales, The Betty Pages, The Comics Code Authority, Tom Brevoort, Tony Lewis, X-Men. Bookmark the permalink. 6 Responses to JIM STERANKO — TOO SIXTIES FOR THE COMICS? Thanks for the nod Guy. Happy to have had a hand in “Bottomgate” … as I’m sure no-one will EVER refer to it again! Also printed in 2009 was “MARVEL MASTERWORKS – NICK FURY, AGENT OF SHIELD, VOLUME 2” which included the SHIELD story from Strange Tales 168. This had the uncensored version. However, when “S.H.I.E.L.D. BY STERANKO: THE COMPLETE COLLECTION” was printed in 2013, it had the censored version. The Artist Edition with that issue has not yet been published. Thanks very much, Tony. I will add to my text. I note that Masterworks volume is out of print and sellers are asking over $50.00 for it. Sometimes even getting it! Looking at the last few pages of “S.H.I.E.L.D. BY STERANKO: THE COMPLETE COLLECTION” , I noticed that it has both offending Steranko pages uncensored, printed in black and white. Thanks again, Tony. A reasonably priced book… I’ve just ordered it. Didn’t know it had the two censored pages restored like that. IIRC it has the “Agent of D.E.A.T.H.” splash page from before the strip was renamed as well. Is that right?